My wife is the flute player of the house but, as a casual player, I have built up a modest collection of Native American style flutes, including a few custom designs. 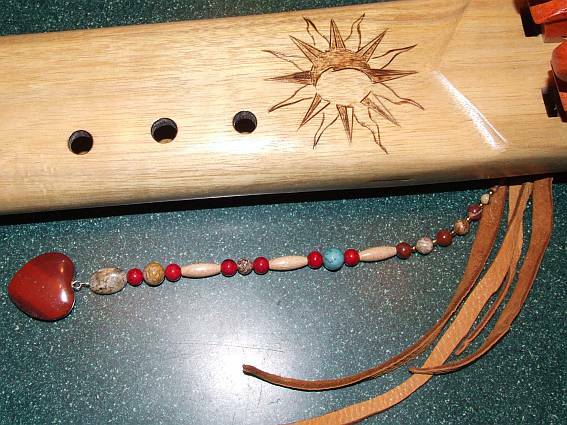 My first Native American style flute was actually this one which I built from a kit. Personally, I was always proudest of the bead and feather work I added as a final touch. This was Gray Wolf's influence. "A thing isn't truly ours until it has been given some of our spirit." My next flute was from Blue Star Spirit. His flutes were wonderful for beginners because the mouthpiece was lathed in such a way that you positioned your lips inside the mouthpiece rather than outside. This gave an added measure of control and expression. Blue Star Spirit no longer makes flutes like this. By now, I was determined that adding beadwork to my flutes would be a personal tradition. 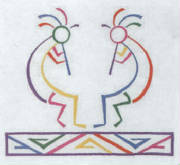 I'll include a close-up of the beadwork I added to each of my flutes. I was looking to buy a new flute for my wife for her birthday when I discovered Miguel Medina of Singing Tree Flutes. 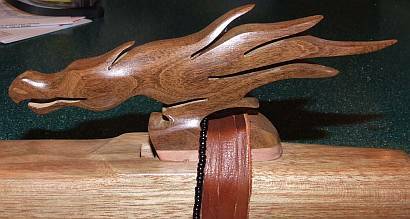 After working with him on several custom flutes for my wife I spotted this eagle flute which he designed and built. I thought this was the most beautiful flute I had ever seen. I bought this one for myself. My eagle flute is in the key of G# (a good beginner's key) and is made of maple with rosewood endcaps. The 3D eagle is made of both maple and rosewood. 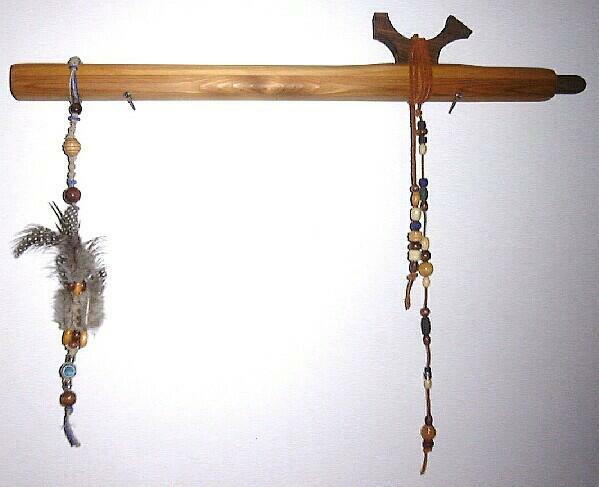 This was my first idea for my own custom built Singing Tree Flute. The key is in low Eb minor, which is an oriental pentatonic scale. That gave me the idea of using a dragon for a fetish (the sound block that sits atop the flute). I found a horse fetish Miguel had done which looked like a horse's head with flames for a body and asked Miguel if he could make one like it with a dragon's head. 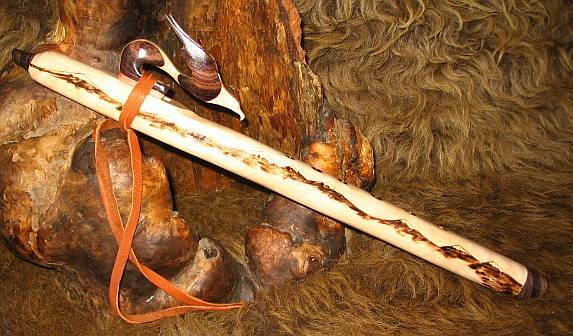 The flute is made of chechen with rosewood fetish and endcaps. My only disappointment was that I envisioned the rosewood being dark and rich like on the eagle flute, which would have created a beautiful contrast to the chechen wood. Who knew that there such a thing as medium brown rosewood? Miguel offered to replace the rosewood with ebony. The sound of this flute is so incredible I wasn't willing to risk it. Here is my latest custom designed Singing Tree Flute. I call it my "Prayer Flute." It is a drone (double chamber) flute made of canarywood with endcaps and fetishes of African paduak. It is in the key of F# and sings beautifully.